In this last book before his death in 2003, Lewis amply demonstrates why peers and contemporaries hailed him as one of the finest travel writers in English in the last century. 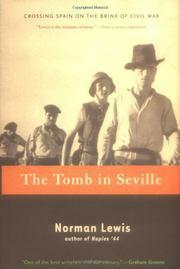 In this story, Lewis and his brother-in-law Eugene visit Spain from England in order to travel to Seville to view the tomb of the Carvaljo family, Spanish ancestors of Lewis’s father-in-law, Ernesto (a “Sicilian man of honor”), and report on its condition. It is, as were most of Lewis’s 14 other nonfiction works, a travel story; in this case one by a 93-year-old writer recalling situations and events that occurred in 1934. Given that, the imagery from a country on the verge of civil war and of its own holocaust stands out as sharply as in a Robert Capa photograph. It’s not just that the author’s cogent observations are perfectly preserved, but also that he has so keen a sense of the dimensions of a culture that’s deep enough to withstand the misery of senseless war heaped upon what was for many contemporary Spaniards the misery of everyday life. Eugene and Lewis literally stroll through a nascent revolution—scheduled trains are not running; buses pocked with bullet holes may or may not hold to their routes. The only way to cross the street in Madrid without immediately becoming a sniper’s target, they quickly learn, is to walk like hordes of other pedestrians with arms fully extended into the air. A necessary 60-mile hike to Zaragoza to pick up ad hoc transport to Seville takes them through stark villages of cave dwellers, as well as mysteriously beautiful oak forests. But everywhere, from the bleakest villages to the grandest of ancient cities, there remains an overriding tradition of hospitality and the interchange of philosophies over bread and wine. Revolution or not, the pair press on to view the tomb in Seville. Fluidity and economy of style, a wit that crackles as it whispers. Every reader should experience Lewis.